It is a common misconception that fixing a crooked smile is something one must do before exiting junior high. It's easy to understand why adults might shy away from the thought of getting traditional braces, for both personal and professional reasons. While the options for getting straighter teeth may have been limited to traditional metallic braces in the past, Invisalign clear aligner trays have changed the way dentists create straight, beautiful teeth for their adult patients. Invisalign offers the same teeth straightening and alignment benefits of traditional braces, without the braces. Using a set of custom-made, clear plastic aligner trays that can be removed for up to two hours each day to eat, brush, and floss, the trays are replaced every two weeks as the teeth begin to shift into place. Invisalign removes the oral hygiene and social stigma of getting metallic braces as an adult, without sacrificing their effectiveness. The decision to skip teeth straightening and smile enhancements because of the fear of how you might look with metallic braces as an adult can cause a great deal of stress and anxiety. Many people have admitted that embarrassment over the way their teeth look often prevents them from fully engaging in the activities they enjoy, whether interacting socially with friends and family, or being proactive in professional and academic settings. Invisalign aligner trays are virtually invisible, and can help adults finally get straighter teeth without compromising a polished, professional looking appearance. 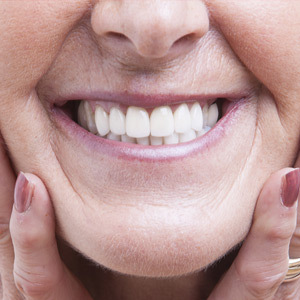 Crooked, misaligned teeth in adulthood are not set in stone. For more information on teeth straightening options for adults, and to learn more about whether Invisalign is right for you, contact a dentist at Gentle Dentistry in Bergen County at (201) 384-1611 to schedule an appointment today!